It’s no doubt that LED Lighting is quickly taking over the construction industry to displace halogen, metal halide, and other lighting options. We have a varied options of portable and rechargeable LED work light for you to choose. These rechargeable and portable LED work lights can be used in a variety of applications. As we know,it is tough to work in the dark. Apart from exposing worker to injuries, working in the dark is really arduous. And workers will find themselves straining a lot. So it will take longer to finish a project. Work lights are one of tools that have been around since the dawn of man. As long as people have had to work in the dark, a version of the work light has been needed. Today’s work lights are in many ways marvels of modern technology. Of course, there are numerous work lighting systems to help us solve this problem. But most of them are poor quality. For example, Lighting systems that use halogens will make everything difficult because of low efficiency. When using quartz lamps, users have to be very careful of where they place the lamps because of the danger from high heat.Another issue with quartz lights is how easy it was to burn out of break the bulb. After an hour or more of being on, accidentally kicking the light could break the bulb. That’s why we have thought deep and then come up with portable and rechargeable LED work light. Most of these LED lights are versatile. So people can use them for camping, hiking, emergency lighting, and more. They also feature a cool-to-touch technology that makes sure users have an easy time handling them even when they are on. Our portable & rechargeable LED work light can withstand a variety of weather conditions including high winds, rain, and freezing temperatures. Our rechargeable and portable LED work light also can perform over long distances from the actual bulbs to the field’s surface. The safety of user is also our concern. Our portable and rechargeable LED work light can make sure that the space is bright enough to avoid injury-causing shadows or glares on the working field. AIS designed rechargeable and portable LED work light to address the varied lighting requirements. Our LED sport light can be used at warehouse, as well as construction plant, workshop and factories. You can choose from a variety of portable and rechargeable LED work lamps ranging from 3W to 100W and from 400 to 12,000 lumens. Our rechargeable and portable LED work lighting can save you up to 85% in energy usage compared to traditional work lighting. Most of our rechargeable and portable LED work light has a lifespan of over 50,000 hours. This will meet the requirements to use the led lights with longer time. It’s wise choice to convert traditional work lighting into more energy efficient LED work light, with all LED lights containing no mercury. 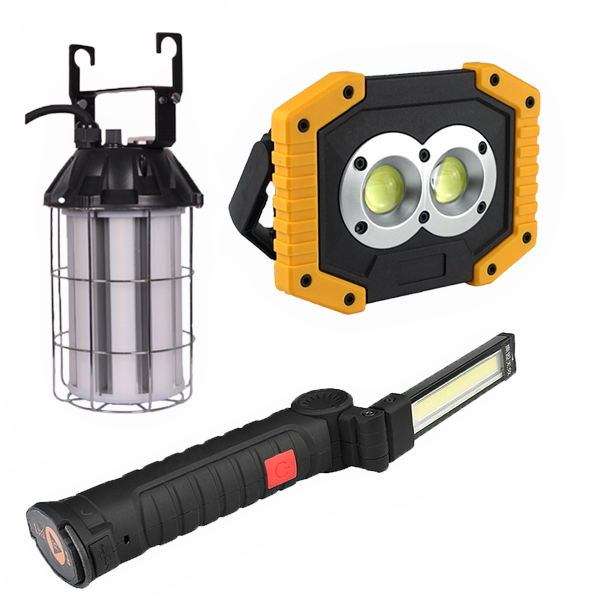 For more information about our rechargeable and portable LED work light, or to order any of the LED work lighting shown below, just contact us. Our LED lighting experts are waiting to communicate with you. As a leading LED work light manufacturer, we will advise you on our best portable and rechargeable LED work light for sale to meet your needs. Our LED work lamp comes with built-in rechargeable battery.So it’s rechargeable by USB port ( included usb cable).It is ideal for outdoor, car repair,camping or security lamp. Our rechargeable & cordless LED work light is 180- 360 degree rotatable to provide multi-angle illumination. The magnet base and hook make your hand free to do other things in the night. We design all our portable and rechargeable LED work light with high lumens LED chips. This means our LED work light has high lumens which is more than 120lm/w. Using our LED work lamps will help you and your clients to save more energy and cost. We use high quality LED driver with our LED work light . Also we use innovative cooling technology with aluminum alloy heat sink. This will ensure our LED lighting with 50,000 life span. What is 50,000 hours? If you ran one LED lamp for 6 hours per day , it would last for nearly 23 years. So you may never change another light for long period. You do not have to use inefficient incandescents and fluorescents that contain mercury. Our LED work lighting is safe, environmentally friendly and contains no toxic mercury.Our LED work lights use 10%-30% energy to traditional lights. As we know,consuming less energy results in fewer greenhouse gas emissions being released into our environment. With our professional technical team, we design our LED work lights with the most attactive appearance. LED lighting is the most gorgeous lighting that illuminates people and surroundings in colour-rich light. Our LED work lighting are designed to blend seamlessly with any architecture. Also,the proprietary diffusing lens and reflector system delivers an optimal light distribution. All Our LED work lights comes with smart design for users to install. Our LED work lights comes with 180-360 degree angle adjustable outfit. Also,some of them have magnetic base so you can fix it with any led work light stand and tripod. This is rechargeable LED work Light with Magnetic Base, 360°Rotate and 5 Modes Bright. For the Plug-and-Play LED work work lights,what's the input voltage I can use ? We design our LED work light with input voltage of wide range. You can use our LED work lights with 85-277VAC. So it’s suitable for most input voltage. For the 3w battery powered work lights,is the 18650 battery removable/user accessible? The 18650 battery is unremovable. It is built inside. There is a usb port on the light.You can use the usb cable connect the light for charge. It is rechargerable. You can learn 18650 battery here: 18650 battery. What kind of temperature will the light withstand ? The working temperature for the LED Temporary Work Light is -40-140℉. Learn more here: How are LEDs affected by heat? How many lumens of the LED work light ? The work lights have different output lumens according to its power. Normally, our LED work light has a lumens which is more 105lm/w. For example,our 3w portable LED work light has a lumens of 350lm. Our 50W portable LED work light has a lumens of 6,000lm. Here is the video of some of our LED work lights. Is the rechargeable battery in the portable LED work light replaceable ? Good question. You can replace the Li-ion battery inside the light. The 18650 Li-ion battery can be recharged more than 500 times and enought to support more than 10,000 hours lighting for the lamp. That’s why we are a leading LED work light manufacturer in China. Will this work light if left on work on a remote switch ? yes, it’s like a regular light, if you have it plugged into a smart outlet that you can remotely operate than it will work.